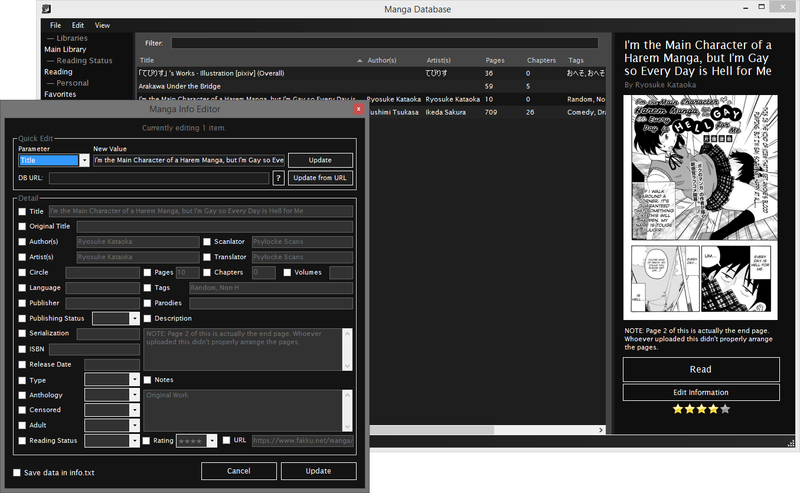 Manga Database is a manga organization program that optionally comes with the full version of HDoujin Downloader. this work with mangas doujins? this grab tags from exhentai? It works with whatever you want to feed into it, and will read metadata files generated by HDoujin Downloader (only the “HDoujin Info File V1” format at the time being). That means you would need to use HDoujin Downloader to grab the tags. That said, I’m planning to do a complete rewrite of this application at some point. When that happens, I intend to add built-in auto-tagging functionality. I have three folders of different types of manga and I want to make separate databases for each type. That way I can have individual libraries based on Genre. My issue comes when I set my main database as the parent folder for those three folders I mentioned. Instead of loading the three folders separately, in some fashion, it loads the contents of the three folders into a giant list that’s extremely difficult to sort. I’m hoping for Manga Database to recognize sub-folders as categories instead of this chapter system. I’d love to be able to make my parent folder for all of my manga, the database main folder, then have the option for all the sub-folders that divide the manga by genre recognized as categories to then enter and exit within the Manga Database. I hope I’m getting my issue and idea across here. It’s sort of hard to explain. I think I understand– You have a folder structure like “db\type1”, “db\type2”, and so on, and you want each of those sub folders as separate libraries (if that’s not correct, let me know!). This isn’t possible at the time being, but I’ll take note of your request. If everything is tagged properly, you might be to able to get something similar set up by right-clicking in the libraries list, clicking “Add Collection”, selecting the new library, clicking “Edit Selected”, and then setting up a filter to only show the genres you want. It’s probably not ideal, though. I’m in the process of completely rewriting Manga Database to be more pretty and user-friendly, so I’ll try to include your request in the rewrite! I want to move a highly rated manga to my tablet. And some files shows cover another page not first pages. If it’s an archive format (e.g., .zip or .rar), the file will be opened instead of the directory it resides in. This is intentional. If the manga is just a folder (i.e. not contained in an archive), the folder will be opened instead. However, I can understand wanting to access the containing folder in order to copy the file somewhere else, for example. I’ll take note of this as a feature request. If you want, you can send me a link to a sample file that’s not loading the cover correctly. I assume you’re using archives– In that case, the program will load the first image in the archive’s manifest. If the manifest doesn’t have the files in the order you expect, that might be why. There is no “export to device” feature at the moment, but I think that’s a good idea! I’ll take note of it for future updates. For the time being, you’ll have to copy the files manually. Is it impossible to arrange in chronological order? Like the modified date of a windows explorer. After deleting the missing files from the library, can I never add them to my library? The program remembers the paths of items that were deleted so the library scanner will skip over them during future scans. There is no way to modify this list directly through the program, but there are ways to do it. Check out this topic in the support forum from someone with a similar question. No, there is no such field available at the moment. You can choose visible columns by clicking any item in the database and selecting “Choose Columns” from the context menu, but all fields relate to the content itself rather than file-based metadata. This is definitely a feature that should be available, so I’ll add it to my to-do list. While it might be a little large to call it a thumbnail, the preview you see in the screenshot above is what it displays. When you click an item in the database, the first image from the archive will be displayed in the pane to the right. Unfortunately, there is no thumbnail view for the library browser; at the current time, it’s simply a list. This is something that’s on my to-do list, but I can’t say when it will be added. I normally delete the list of downloaded doujins when the list becomes very long and did not have the meta data option enabled. Then this program the first time I use it, the more than 900 doujins I have I’m going to have to manually put the information to each one? If you didn’t generate metadata files, then unfortunately yes, you would need to enter the metadata yourself, since the program would have nowhere to draw it from. On that note, it’s been a long time since it’s last been updated (and the program is still in beta), so it is currently only able to read “HDoujin Info File V1” files. So, if you’re planning to use them, that’s the only option at the current time. So is this integrated with the downloader, like will it automatically add the doujin information straight from the downloader and take the tags from the site linked, or is more of a manually add each doujin and then add the download url to get tags, or just manually add in your own tags. Can only really see myself using this to sort my collection into categories, and it is a cool idea but I have way too many to tag each individually. If you’ve enabled metadata file creation in HDoujin (under “Settings > Save to > Metadata”), you can choose to save all of the doujin information (info.txt) or just the tags (tags.txt) to a text file. Both files can automatically be read by Manga DB, and their contents will be imported into the database. The catch is this only works with the tags files and the “HDoujin Info File V1” format, since the additional formats were introduced later on. Under “File Formatting”, you have the ability to select which type of file is generated (but if all you want is tags, just check off “Create .txt file containing tags”). I’m sorry, but how can I set the settings to appear ‘tags’ on database like your screenshot? No need to apologize! Just right-click anything in the list, and select “Choose Columns”. A dialog box will open, and you can move columns to the left to make them visible (and to the right to hide them). Oh, I found it. Thanks a lot! I have one more question. Is there a way to initialize(or reset) the settings of the list of ‘watch folder'(I mean, ‘library’ in ‘options/settings’)? You mean removing folders that are already in the list, or resetting the list? I’m sorry to say there’s not currently a way to do this through the GUI, but it’s not impossible if you edit your “config_db.ini” file directly. Just open it up in Notepad, scroll down to the “watchedFolders” key, and then you can edit the directories as you see it. I’ll add allowing the editing of these folders through the options menu to my to-do list. This is something I definitely want to add for my own purposes, as well. When I finish with the pending updates for HDoujin, I plan to rewrite Manga DB from scratch, and thumbnails will be the new default view.